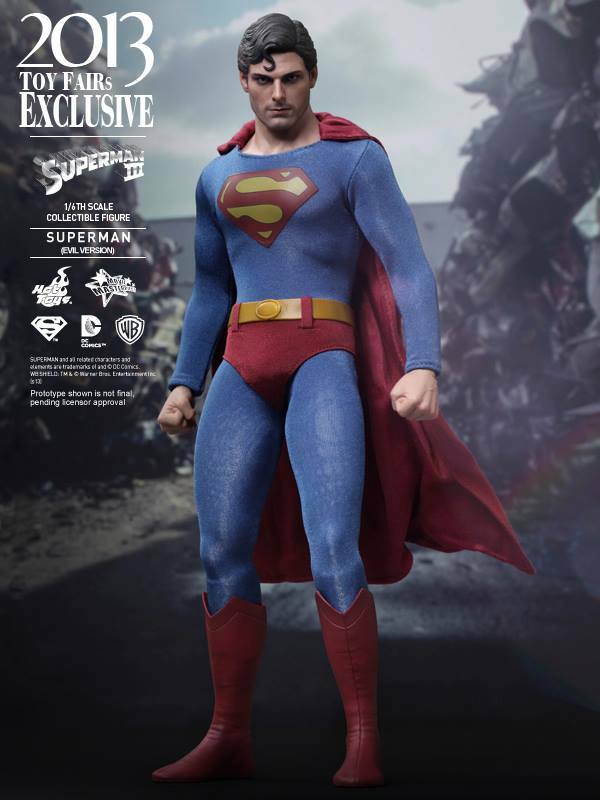 Few exclusives for the annual SDCC (San Diego Comic-Con) are more feverishly anticipated than the strictly limited edition figures presented by Hot Toys. 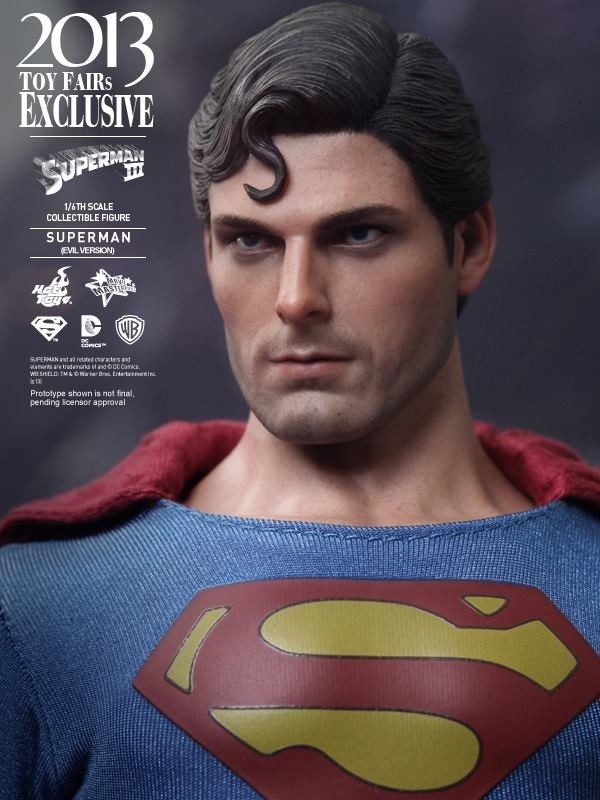 No-one could’ve forseen, however that 2013’s assortment would include a variant from the classic Superman Movie franchise (MMS 207, offered alongside figures from G.I. Joe and Captain America respectively). While its gratifying in the extreme that Hot Toys are still producing figures based on the license (with hopefully more to come?) one is conflicted about the ‘Evil Version’ from Superman III, much like the character himself. 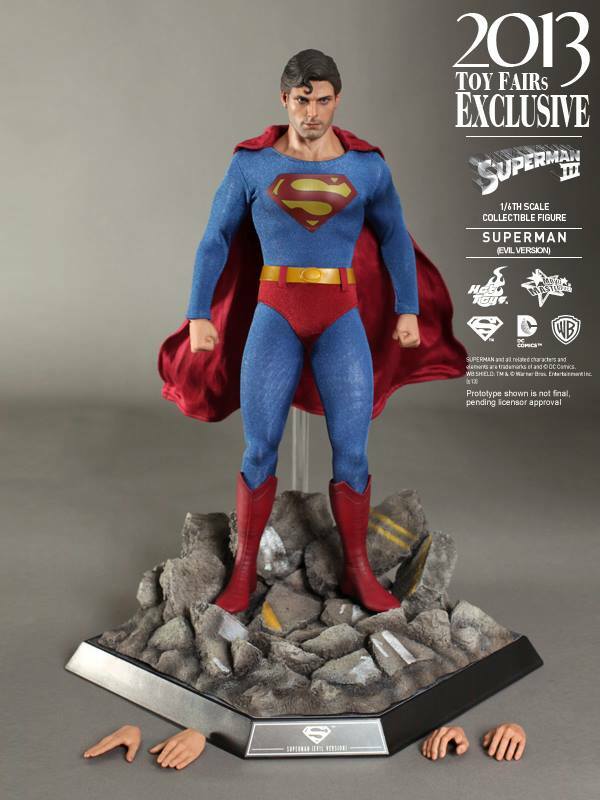 A cynic might say it would appear Hot Toys have recalled all their unsold units of their hugely popular Superman: The Movie figure and casually applied a layer of black spray paint whilst simultaneously jamming it onto a rejected base for their thunder-thighed Man of Steel figure. Others may say its a cunning must-have variant (apparently limited to 600 units) from a beloved franchise. Before you decide which camp you’re in you may want to consider – Is this really just the exact same figure as previously released albeit with new stubble paintjob/blackend suit? Ah, yes it is. But then you may wonder – Given all the iconic expressions from the Junkyard sequence surely another ‘enraged’ headsculpt would be more appropriate? Indeed it would. Next you may think – And why is it so slight on accessories? 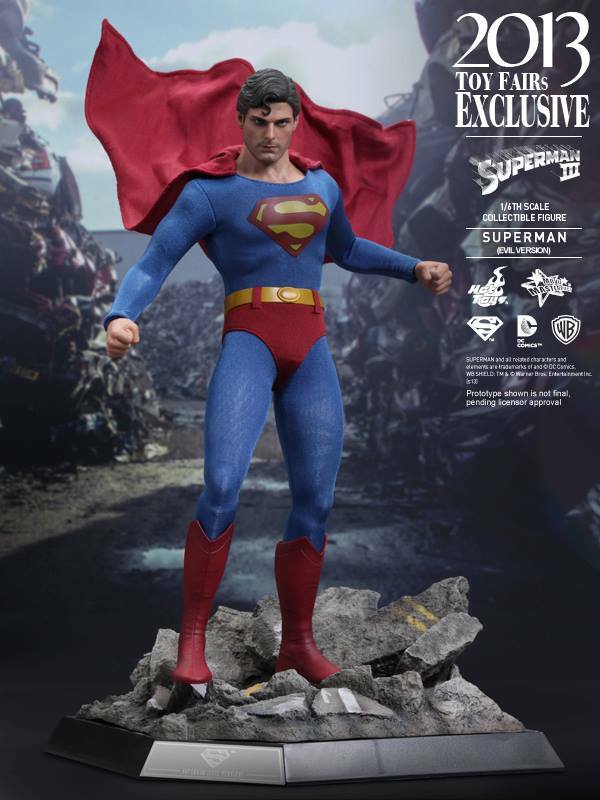 There are so many cool things that could’ve been included such as the Whiskey Bottle, Dirty Kryptonite chunk, Steel Girder and shattered Clark Kent Glasses – Seems almost evident, no? And finally you could be forgiven for asking – What’s with the base? What a wasted opportunity to have him emerging from split tyres just like in the movie!! Well, quite. Hopefully you’ll be too busy noticing they didn’t even take the initiative to fix the artwork for the chest shield to notice the base is better suited to the Chitauri from The Avengers. Unlike previous posts where due to the uniqueness and quality of the original figure I was passionate about promoting it whilst campaigning to fix some of the details, there will be no such endorsement this time. While I’m overjoyed the line still rightly makes a contribution to the Christopher And Dana Reeve Foundation this effort (or lack of) does not earn itself a place in my collection, will it earn one in yours..? oh well maybe they will do some of that before release? Thanks for your comment, I agree 100%.